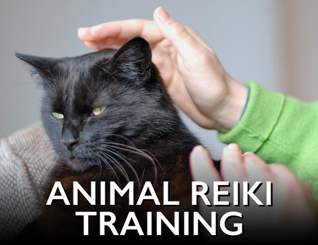 This class is intended for anyone who is interested in learning Reiki for animals. Reiki can serve animals in the following ways: maintaining health and well-being through regular sessions; aiding in pain management for animals who are ill or injured, as well as post-surgery; promoting relaxation and calm for animals with emotional issues, anxiety, separation anxiety or stress (including pre-surgery); increasing bond between human and animal - a great way to ease an animal's transition to a new home environment or to enhance training your pet; and bringing peace and comfort to our animals that helps ease their transition to the rainbow bridge. In this class, you will learn about the history of Reiki, receive your attunement and learn some basic principles for working with animals. Animals are highly intuitive and sensitive to the energies of their surroundings. Reiki is a healing energy that can be used alone or as a complement to other healing practices, balancing the energy patterns and strengthening the animal's natural healing systems. When this is accomplished, the animal's body, mind and spirit is at optimal performance and can heal itself. A workbook will be provided. Certification provided upon completion of course. Register for this class using this link: Animal Reiki. Registration opens on January 28.